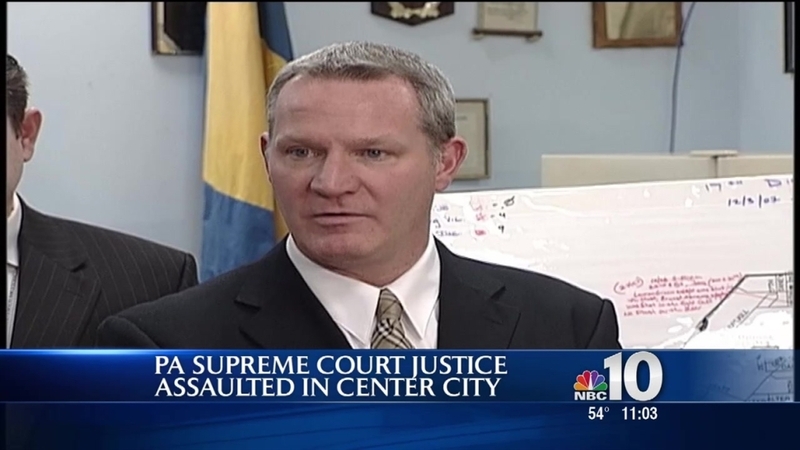 Pennsylvania Supreme Court Judge Kevin Dougherty has been hospitalized after being assaulted by a homeless man in Center City Friday night, police said. The assault happened around 6 p.m. at 15th and Market streets after the man allegedly asked Dougherty for cash as he left Philadelphia City Hall, investigators said. Dougherty was taken to Thomas Jefferson University Hospital for treatment. He's listed in stable condition. The suspect was apprehended by SEPTA police at Broad Street and Girard Avenue, SEPTA said. Detectives are investigating the incident. Dougherty began serving on the state's highest court this year after being elected to the post in November. He previously served as a Philadelphia county administrative judge. He is the brother of electrical union boss and city power broker John Dougherty.